Life can get overwhelming at times, hence keeping track of all our responsibilities can be hard. Juggling all our tasks and responsibilities is not a viable option or even a realistic one. The only result of trying to do all tasks at once is a failure. This is where the importance of owning and utilizing the effectiveness of a planner comes in. A planner generally helps you schedule your tasks and responsibilities hourly. Hence, at a certain time during the day, you have a task you are meant to achieve or complete. This then begs the question, why are planners so important? Why should you purchase or invest in one? Well, by using a planner, you are able to space out your tasks and responsibilities of the day. This then allows you to focus on one task at a time, especially the most important ones. In other words, it helps you prioritize. This, in turn, helps increase your level of productivity and efficiency both at work and at home. Maybe you’ve been thinking about purchasing one? If you have, you’ve come to the right place. This article focuses on the best planners that can help you stay organized in your everyday life. Let us take a look, shall we? Every year, Erin Condren releases a new set of new planners with a new look and design. Each new additional feature sets the bar for the next release. Of course, some changes are more subtle than others, while others are obvious. This particular planner is a personal favorite for many, and rightly so. One of the reasons being how easy it is to customize it. In other words, you can change how it looks in terms of color scheme, the layout and even the cover of the planner itself. The fact that you can choose the type of layout is an added advantage. You can either choose an hourly layout or a horizontal or vertical one. From their different options, it is clear that their designs are created to suit customers’ preferences. You can write down your plans according to how you prefer them. The latest release, in particular, comes with thicker pages. The thickness of the paper helps lower the chances of the ink bleeding through it. The Living well Planner combines both aesthetic and functional. It is intricately detailed with well broken down and divided goals and tasks on a daily, weekly and monthly basis. Each goal is also divided into different areas of your life, such as personal growth, financial goals and health and fitness. At the end of each month section, there is a section that allows you to write down your personal thoughts. 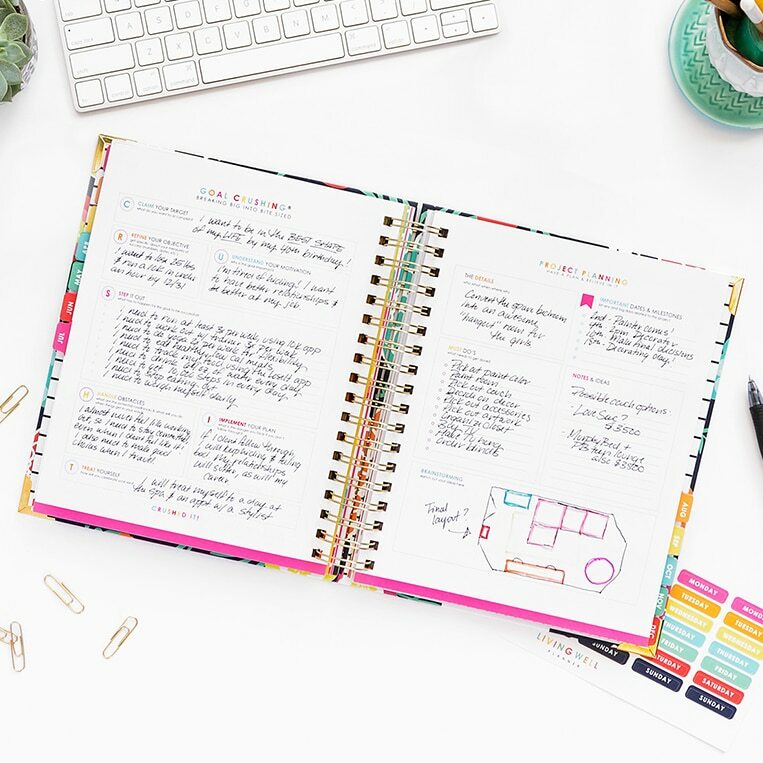 The perfect feature that comes with this particular planner is the Must- Do’s, Should- Do’s and Would Want To Do’s section. This allows you to prioritize your most important tasks first. Also, it comes with its very own calendar. As compared to the Erin Condren Planner, this one is more functional. The look and design of the Xo Planner are definitely unique, setting it apart from all the others. This look, this planner embraces the marble look which is a current trend. Each marble cover design comes in a myriad of colors, from monochrome to bright. The differences in color scheme allow it to meet customers’ preferences. Whether you like a more sophisticated look or a more moody one, there’s one for you. Inside the planner, the pages utilize the use of white space for an aesthetic appeal. In other words, the planner does not have a cluttered look of words and quotes. Additionally, it does not use different colors or fonts for words. Each section is divided into monthly, weekly and hourly. Each plan is divided into sections as well. They include health, To- Do’s, water, schedule, and even has a post-it schedule. The favorite feature is that this planner dedicates an entire page to financial planning. This allows you to make a more detailed plan for your financial expenses, as well as track your money. The Simplified planner, by Emily Lee, is also very popular due to its simplicity and functionality. The designers managed to use both color and the use of white space. The result, a true masterpiece that allows freedom in planning, while enjoying the beauty inside of it. This particular planner also comes with stickers that make planning both fun and easy. However, you can either purchase a weekly or daily edition planner, In other words, you’ll have to purchase two different editions. However, this allows for a more spread out schedule. The first pages of both planners, come with a guide on how to use it. This is an added advantage. This particular planner is tailored around the idea of the Law of Attraction. The Law of Attraction allows you to achieve your goals and plans through the power of positive thinking. In other words, what you think you attract. This planner allows you to write down those positive thoughts into plans. Hence, it helps you maximize positive thinking and living. However, the planner comes in three: the Weekly Dated Delux, Daily Planner, Weekly Updated Delux edition. They all come in differed colors and sizes as well. Beyond its aesthetic qualities, it is very functional and effective. This planner was definitely designed with women in mind. From its look and color scheme, it’s clear they had women in mind when they designed this. The inner pages cannot be customized, however; the outside cover can. It comes with a myriad of covers that suit different types of preferences and personalities. Regardless of its size, you can carry this planner around with you. The inside design maximizes on the use of white space, rather than décor and color. If you have a hectic and busy lifestyle, then this is perfect for you. At the beginning of the planner, there is a 12- month overview. This allows you to plan out your entire year, or at least have a general overview of expectations. The Happiness Planner is quite different from many other planners. While it seeks to help you achieve your plans, it also seeks to cultivate happiness and gratitude. In each daily plan section, there is a quote. Also, alongside is a section that allows the user to not only write his/her plans, but what they are most grateful for. It also comes with a weekly section, allowing you to plan out your weekly plans. The design and look are also very aesthetically pleasing. However, you might be limited in terms of space. It doesn’t come with customizable covers and does not concentrate on flair, colors and decor. In conclusion, planners are often released during the month of May. So, if you are looking to find the perfect planner for you, you’ve come to the right place. All the above-mentioned planners are different to suit different types of personalities and preferences. Don’t miss out! You can plan your life, and have fun while you’re at it. If you enjoyed this post share it and comment which one is your favorite planner. Maybe you have one that you really like tell us in the comments below.